Every festival in India sees some unique bits of celebrations in different states. Recently, a lot of communities rang in the celebrations of the beginning of the Hindu new year and also the harvest festival. People of Assam celebrated their new year celebrations of Bihu on April 15. 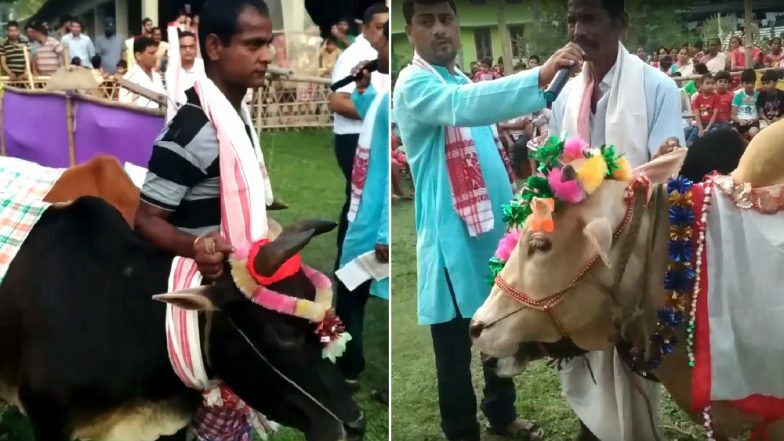 While a lot of places sees the traditional song and dance by the Assamese community, one village called Pathsala in Barpeta district celebrates it with cows. And it is not about worshipping cows on this day, but people organised a 'Cow Fashion Show!' Bihu Celebrations in Space! Old Video of NASA Astronaut Doing Traditional Folk Dance Goes Viral on Assamese New Year 2019. As a part of their tradition, a fashion show of cows was organised at Gobindapur Satra in Bajali of Barpeta district, Assam. The villagers decked up the cows with unique clothes, bells, garlands and the traditional Assamese 'gamucha.' No doubt it is a fun-filled event and farmers wait all year long to bring their cows as participants. Cat Steals The Show as it Graces the Ramp With Its ‘Catwalk’ at Fashion Show in Turkey; Watch Video. The first day of Rongali Bihu is dedicated to the cattle. On this day, people take their cattle to rivers, ponds and other water bodies and give them a ceremonial bath. They are applied with a paste of turmeric and other herbs. After this bath, they decorate their cattle with woollen flowers and colourful beads for this annual show. Bohag Bihu 2019 Date & Significance: Know History Associated With the Seven-Day Festivity of Rongali Bihu. One of the locals was quoted to a report, "For almost a decade now, we are organising the fashion show for the cows on Goru Bihu. All the villagers assemble in an open field and enjoy the show. The cattle are cleaned, worshipped and decorated with colourful covers and trinkets." They also informed that the festive preparations for this fashion show begin a month in advance. Road to Avengers EndGame: Explaining Why Thanos Was in a Hurry to Get the Stones in Infinity War After Waiting for 18 Movies!